Today’s challenges in developing high performance, low consumption and ultra-low emission engine and catalyst designs demand very fast, sensitive and detailed emission monitoring systems. 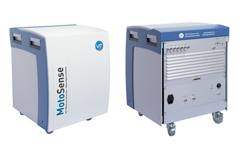 The V&F MotoSense serves as a powerful tool to study organic HC as well as inorganic N and S gaseous emissions in raw exhaust gas and tail pipe by automotive and catalyst researchers. Fast gas response times of 20 msec and a high dynamic range of 1 to 104 enable detailed study of nonsteady processes. Forward to the MotoSense product page.